Lago, the first Italian restaurant from James Beard Award-winning chef Julian Serrano, opened last week at Bellagio and we were lucky enough to get a taste of the menu last night. The restaurant serves a small-plate menu with seafood, vegetarian dishes, pastas, pizzas and more. Trust us, you’ll want to try things like the red wine risotto with burrata and the slow-cooked short ribs. Pair your meal with the Rosso Bellini cocktail and you’ll thank us later. 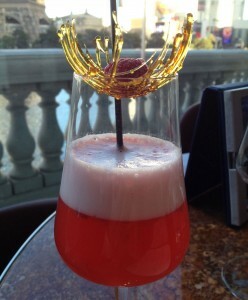 The drink, made with Hangar One Raspberry, Toschi Fragoli wild strawberry liqueur, Prosecco, raspberry syrup and fresh lemon juice, is topped with a beautiful caramel nest holding a gold-dusted raspberry. Not only are the food and drinks beautiful, Lago has one of the most breathtaking views of the Bellagio Fountains you’ll find in town. The restaurant has floor-to-ceiling windows overlooking Lake Bellagio as well as an intimate patio outside. Make your reservations now. Be sure to end your meal with a dessert. You really can’t go wrong with anything but we think the tiramisu is to-die-for. Lago is open from 5 p.m. to 11 p.m. nightly and is located off the casino floor next to Hyde Bellagio.